The time spent by this reviewer with the new book, “The Corporation” was pure enjoyment. I was fascinated with the personalities author T.J. English tells us about in this “epic story of the Cuban American underworld”. The characters’ life choices were way beyond my own experience. I didn’t even know the real story behind the Bay of Pigs invasion, a critical activity in the stories of many of the characters. And once a network of Cuban Americans began offering off-the-books gambling opportunities in poor communities, every page was (to this non-East Coaster) a revelation. I kept turning pages. 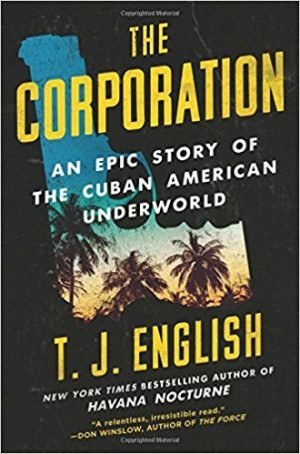 The world described in “The Corporation” includes dedicated anti-Castro activists; gangsters in New York, New Jersey and Florida; bribable public officials; investigators who doggedly chase the “bad guys” for decades and violence of tremendous proportions. As with most non-fiction. I never felt my reading time was wasted. A mini-history lesson is absorbed along with the stories. Author English, tells us the book came about because two Miami-based movie producers were planning to do a movie about Jose Miguel Battle Sr. and his gambling empire known as “The Corporation”. They thought they could pitch their idea better if first, the story was a book. English had written a previous book about Cuba and one about Whitey Bulger’s underworld and knew a little about Battle and The Corporation. He enthusiastically agreed to do the book. I understand a film will be coming. The detail in this book is staggering. I couldn’t imagine gathering all the information that is on every page: names, places, actions, conversations. One might have trouble keeping track of everyone, but the book’s main characters, Jose Miguel Battle Sr. (El Patrino, the Godfather) and David Shanks, the officer who chased him for many years, carry us through. I kept reading because the book was well written and filled with tension. I had to know what would happen next. I was reminded of a quote from a writer friend of my mother’s. Poet Ellen Graf once wrote a poem with the line, “Imagine me, at 80, with book.” I felt very “with book” when “The Corporation” took over my reading nook, my time and my imagination. After three failed attempts, Palulu was ultimately no longer a problem. For non-fiction readers and especially lovers of true-crime stories, “The Corporation”, is a great read. You’ve definitely made me want to read/listen to this book! Thank you!